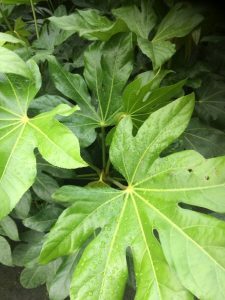 Classic PNW shrub False Japanese Aralia as it has been called is a bold, tough, evergreen shrub for part shade to shade. Moderately fast growing to 7′ x 7′ in 7 years. Part shade to shade in rich to average well drained soil. Regular summer irrigation or none when established. Takes dry shade like a champion. Long lived shrub for bold effects in woodlands, large landscapes. Cold hardy and good looking year round. In time it forms stretching trunks with the foliage clustered at the tips. Takes well to hard pruning which should be done in late spring- water well after doing so. Large divided spikes hold white orbicular flowers in autumn. Seldom sets seed in our climate. Moderate deer resistance.